Hello! It's time for a brand new Mojo Monday sketch (#244). It's June Contest Week, and Julee has a great sketch for us this week! I hope you play along for a chance to win some Verve stamps! My parents are celebrating their 60th wedding anniversary on Friday, and this is the card I made for them. I used Love Story to stamp my frame and sentiment. Happy Anniversary, Mom and Dad! 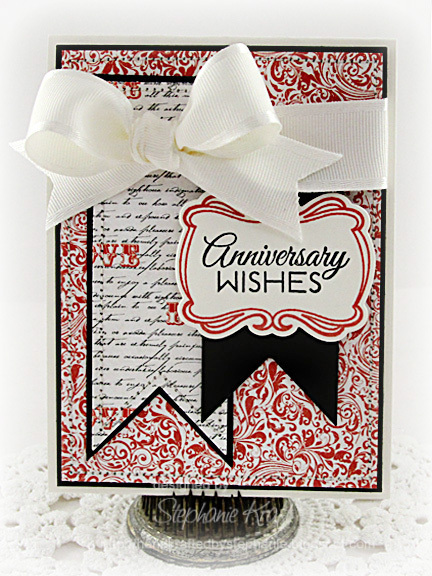 Accessories: A Cut Above Dies: Lovely Marquee Die, Ribbon Banner Die (Verve); Ivory Grosgrain/Satin Edge Ribbon (The Ribbon Carousel), Foam tape, Thread, Sewing machine. Beautiful, Stephanie! 60 years - amazing - best wishes to your parents!! Stunning, I need to relax on trying to recreate the sketch exactly. Best wishes to your folks. Beautiful Anniversary card for your parents Stephanie! WOW! 60 years! That is wonderful!!! Congrats to them! Surely they will treasure this beautiful card!